Games Workshop have really been on good form recently with the quality of their painting tutorial videos. In many ways I thought that this book didn't really need to exist, as actually seeing someone paint is infinitely more useful than reading a description - but a real focus on variety and fleshing out the background of some of the less well known aspects of the Space Wolves makes the book well worth the asking price in my opinion. The guide presents four very different great companies, the Firehowlers, the Deathwolves, the Iron Wolves and the Champions of Fenris. This shows the depth that a single chapter can have within it, showcasing a few of the different themes you can choose. Space Wolves get a lot of flak for their recent focus on the 'wolf' side of the coin, but there's plenty of other options you can choose if you so wish and this book really shows them off. It's great to see a couple of the less obvious choices shown off here; Ragnar and his company would have been easy to throw into this book, but it's great to see other Wolf Lords getting a turn in the limelight. There's a lot more space dedicated to background than I was expecting, giving a broad overview of the companies, then focusing in on the history and accomplishments of various packs within them, accompanied by lots of GWs usual high quality photographs. Interspersed there's advice on pack markings, how to apply company markings to vehicles and other iconography. The information is nice, and presented pretty organically, but it would have been better if it was all in one section within the book. Each company has its own cool aesthetic, the warriors of the Firehowlers are covered in tattoos representing their accomplishments and look every bit the berserkers, whilst on the other end of the spectrum you've got the cold and mechanical Iron Wolves. Sven Bloodhowl and Egil Iron Wolf are pretty cool converted miniatures too and whilst they're not too hard to work out given the book tells you what they're actually based on, it would have been nice to have seen proper step by step tutorials for these. This is all the stuff I actually bought the book for, if I'm honest; I'm reasonably confident painting my army at this stage. I'm pretty satisfied with the information presented, it gives just enough hints and ideas without outright giving the definitive answers or listing all the packs within the companies. There's still plenty of room for your own imagination! By some serendipity, the two Grey Hunter packs I'd painted so far happened to be ones detailed within the book as belonging to the Deathwolves! Happy with that! I also learnt that within the Deathwolves the Wolf Guard keep their old pack markings, just painting them yellow and black. With that in mind I decided a little repaint was in order! 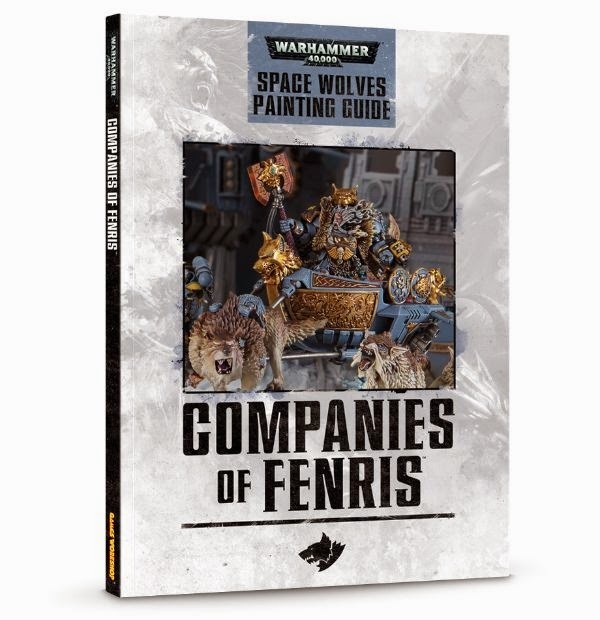 I don't think that there is a single aspect of painting a space wolf that isn't in this book. Armour, fur, plasma coils, bone, parchment, metal, gold, gems, it's all covered. The only omission I noticed was no tips for painting eyes. A weird oversight but I have noticed painting eyes is falling out of fashion, so maybe that's why. Not content with telling you how to paint everything, there's usually several different methods for doing it! It's a great resource, with eight methods for painting fur and nine for painting the faces of your warriors! I can't praise the sheer variety of painting guides in the book enough - each ranges from only a few steps to about 12, depending on the level of detail you're after - and you're bound to find a way of doing things that works for you. Yet I'm not sure I can recommend this book alone for a new painter - Games Workshop still seem insistent on not teaching basic technique in their guides. You won't discover how to drybrush; or take care of your brushes; or correctly thin your paints in this book. Thankfully the internet is an amazing resource for that kind of information but I wish Games Workshop would start putting that kind of information in again. They're putting it in their video tutorials, which are free, so I'm incredibly surprised it's not going into their paid products. If you want some tips on how to paint your Space Wolves, or something to help you work out pack or company markings, this is a great book. The price is right too; at £20 it's a downright bargain for a Games Workshop product. I'm really interested to see if GW releases any similar products for other armies - it would be a shame if a product of this quality was a one off.